Users hate the horizontal scroll. It’s annoying, unintuitive, and amateurish. The trouble is that SharePoint seems to love it. SharePoint pages often need to be trimmed down to fit a typical screen. Here are a few tips for getting skinny with your pages. “Modified Date” and “Modified By” is displayed in the default view of a document library. These columns take up unnecessary space on the page. Create custom views of each web part for each page to only show the columns that are relevant. Consider whether the user really needs all of that information on this page, or if clicking on the web part to get the details is sufficient. Some web parts are too wide for multiple column layouts. There is no way around it. If that’s the case, don’t use a two or three column layout. Just use the one column. Calendars, for example, are hard to read unless they stretch across the entire page. If you really must display a calendar on a page with other content, the list view of the calendar may be the best option. Also, notice that the “One column with sidebar” Text Layout has a narrower right column than the basic two column layout. If the web parts you want in the right can be made very skinny, this may work well too. In some cases, you might want to switch to a 3 column layout to make the best use of the space. View your page in edit mode and click on Edit Web Part in the drop down for the web part that is too wide. 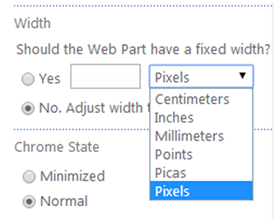 In the Edit window that appears to the right, under the appearance section, you can limit the width of the web part. If the web part is too large for the width you determine a horizontal scroll for just that web part will be added. 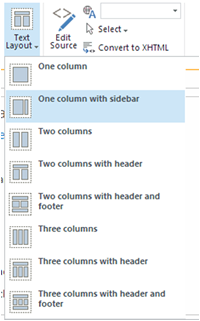 SharePoint Designer gives a user complete freedom to adjust margins, padding, web part width, and everything else having to do with the way a page looks. Pop the hood to make everything fit perfectly.